Team Nika of Vladimir Prosikhin won the single race completed on the penultimate day in Porto Montenegro. Friday’s race has left Igor Lah’s Team CEEREF still leading but with John Bassadone’s Peninsula Petrolum now up to second ahead of Chris Bake’s Team Aqua. Fourth placed Team Nika has closed the gap on the podium down to three points. The wind started dropping almost the moment the timing for the sequence was announced. Artemis Racing won the pin but was held up from tacking by the boats above her. 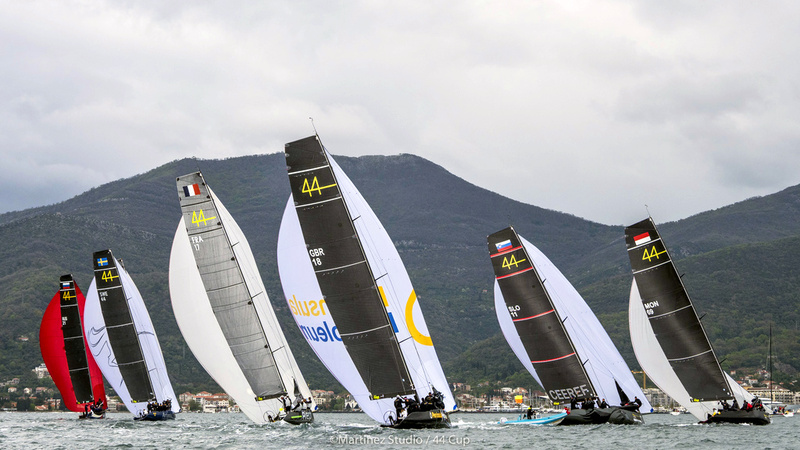 Nonetheless the left side seemed to pay off up until the very top of the beat when coming in from the right the new Russian 44Cup team, Pavel Kuznetsov’s Tavatuy Sailing Team scored a major coup rounding the weather mark first. Vladimir Prosikhin’s Team Nika also slipping in relegating Artemis Racing to third. On this occasion the right paid with Team Nika slowly easing ahead. With the wind dropping to nothing across the bay, the race was shortened at the top mark. Team Nika and Artemis Racing ghosted across the line, the Russian team taking her second bullet of the 44Cup Porto Montenegro. After a pause the fleet was sent ashore, and after a patience wait, racing was concluded for the day.